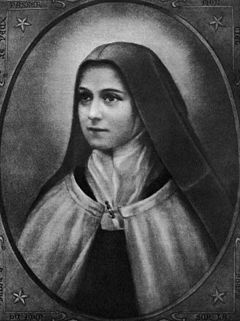 St Thérèse was born into a devout Catholic family at Alencon, France. She is also known as Therese of the Child Jesus, the Holy Face and the Little Flower. St Thérèse yearned to become a nun and at the age of 15, joined her two elder sisters in the Carmelite community of Lisieux. There she lived a hidden life and “wanted to be unknown”. She believed that it wasn’t necessary to do heroic and great deeds to attain holiness. St Thérèse once said: “Love proves itself by deeds, so how am I to show my love? Great deeds are forbidden me. The only way I can prove my love is by scattering flowers and these flowers are every little sacrifice, every glance and word, and the doing of the least actions for love”. Sadly, after eight years as a nun, St Thérèse died of tuberculosis but her writings continue to be an inspiration to those searching for peace and understanding across the world. St Thérèse’s Feast Day is the 1st October. She is the Patron Saint of HIV/AIDS sufferers and co-Patron of France with St Joan of Arc. Pray for us that our simple actions of today will be a scattering of flowers at the feet of Jesus.